SACRAMENTO, California, October 10, 2017 (ENS) – At least 20,000 people have fled their homes, as 17 wildfires rage on in eight counties across northern California’s wine country. Vineyards are scorched, forests have gone up in smoke and hundreds of houses are burned to the ground. State fire officials say that the 17 large wildfires sparked in the past 24 hours continue to burn across California, consuming over 115,000 acres. Sheriff officials have confirmed that 17 people have died as a result of the wildfires in Sonoma, Mendocino, Napa and Yuba counties, and many more have been reported missing. An estimated 30,000 people have been ordered to evacuate and as many as 19,000 homes are in the paths of the fires. In the heart of California wine country, Napa County, the Tubbs and Atlas Fires are burning out of control. Several hospitals have been evacuated, thousands are without power and schools are closed. Emergency officials report that as many as 1,500 structures are destroyed. Several Damage Assessment Teams have been deployed to get a full account of the destruction, says the California Department of Forestry and Fire Protection. The winds that fanned these fires Sunday night and Monday morning have decreased, allowing firefighters to make good progress overnight, but local winds and dry conditions remain a fire risk. Governor Jerry Brown has declared a State of Emergency in Napa, Sonoma, and Yuba counties, as well as Butte, Lake, Mendocino, Nevada and Orange counties, and on Monday he requested federal assistance to help in coping with the blazes. The White House today approved Governor Brown’s request for federal assistance. The Federal Emergency Management Agency, FEMA, approved Fire Management Assistance Grants for 10 fires in California to help cover the costs of staffing, equipment, and emergency work. Red Cross disaster workers, with partners, are supporting evacuation centers where people can find safe refuge from the fires. More than 2,000 people sought refuge from wildfires in 20 Red Cross and community shelters across the state last night. Thousands of additional cots, blankets and emergency relief supplies are being mobilized now to support relief efforts. Volunteers from across the country are now traveling to California to support sheltering, feeding, logistics and planning efforts. The Governor’s Office of Emergency Services also has activated to its highest level the State Operations Center in Mather, California. This center is coordinating closely with other local, state and federal emergency response officials to address all emergency management needs. The grape harvest has been affected, but vinters’ trade groups say it’s too early to tell how great the damage will be. The fire has reportedly destroyed some of the region’s many vineyards. The area’s cannabis harvest is also threatened, with many growers under mandatory evacuation. The nonprofit trade association Napa Valley Vintners has received wildfire updates from more than 100 of their members. Four owners suffered major or total destruction, and at least nine reported damage to their winery or vineyards. The association has yet to hear from some NVV members in the most vulnerable areas of the valley, including along the Silverado Trail and in Calistoga. “Complicating matters is the fact that it is harvest season in Napa Valley. However, we estimate that 90 percent of the grapes were picked before the fires started on Sunday night. Wineries able to assemble crews and safely get to their vineyards are continuing to harvest grapes,” said the NVV in a statement. One of the most damaging of the fires, the Tubbs Fire, started near Tubbs lane in Calistoga on the evening of October 8 and has burned at least 27,000 acres. Hundreds of structures have been destroyed and tens of thousands of people have been evacuated. In the Fountain Grove area numerous homes, the historic Fountaingrove Inn, Round Barn, and a Hilton resort were destroyed. By noon on October 9, hundreds of homes and two hospitals had been evacuated and some shelters were already at capacity. On October 9, Pacific Gas and Electric Company was working to restore power to over 100,000 customers. The utility cut off natural gas to 13,000 Santa Rosa customers in areas where the fire was active, and warned that more cuts might be needed as the fire moves. Power outages and the inability of employees to report to work also have also created challenges for wineries, especially for tasting rooms. However, most wineries have emergency generators, now in use to maintain production capabilities. The grapes remaining on the vine are almost all Cabernet Sauvignon. “Our winemakers report that this thick-skinned variety, fully-developed and ready to be picked for the 2017 harvest, is not expected to be impacted by the smoke from the fires,” the association said. In Sonoma County, Paradise Ridge Winery, owned by the Byck family for generations, burned down. “Our thoughts are with the many who have lost so much and we count our blessings that our family and team are safe. We are resilient and we will rebuild,” write the Bycks. Paradise Ridge made a point of sustainability, installing and using solar power, and using sustainable materials in the vineyards and winery. 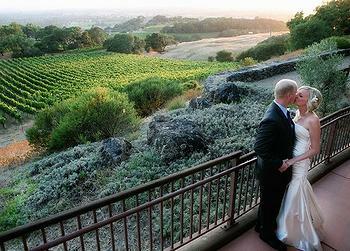 Paradise Ridge lies on the eastern boundary of the Russian River Valley Viticultural Area. Of the 156 acres, only 15 were planted to vines, most along the contours of a property dominated by 200-year-old old oak trees. Mountain lions, coyotes, deer, raccoon, hares, and wild turkeys frequented the land, now scorched. 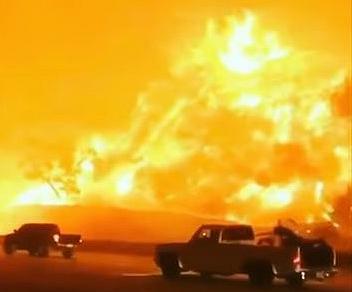 Historically, October is when California experiences its largest and most damaging wildfires. Residents are asked to remain prepared for wildfires. Learn more evacuation tips by visiting www.ReadyForWildfire.org.